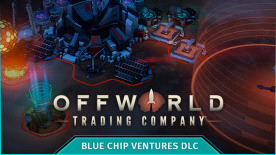 Requires Offworld Trading Company (Base game) to use this DLC. Predict markets, effectively sabotage your opponents, and break monopolies in Blue Chip Ventures! This series of new single-player scenarios is designed by one of Offworld Trading Company’s top competitors - will your business come out on top, or will you be filing for bankruptcy? Over a dozen scenarios will require you to play at your very best in order to beat difficult objectives. A handful of the scenarios marked as “challenges” will require nearly flawless execution of everything you’ve learned and will make even the most veteran of players work hard for their victories. About the Designer: Known within the Offworld Trading Company community as “Blues,” his quest to become a top-tier player and interest in numbers led him on a search through the code for a better understanding of the game’s mechanics. Inspired by some of the more unique Daily Challenges, Blues set out to design several custom scenarios that will provide new and interesting single-player experiences. Scenarios: Learn valuable management skills and become a better executive by undertaking one of over a dozen unique scenarios from different categories. • Supply and Demand: They want it? You’ve got it. Focus on monopolizing resources and learn the right times to shift your focus to keep yourself ahead of your competition. • Play Well With Others: Can’t we all just get along? Focus on how best to handle your opponents - and also how to work well on a team with your allies to seal your victory. • Long-Term Planning: You’re in it for the long haul! Deal with debt strategies and turn around a losing game through careful planning. • Challenge: Playtime is over! These scenarios will force you to take all of the concepts you’ve learned and execute them flawlessly in order to win.